The coastal community of Wainui-Makorori stretches for four kilometres along the Pacific Coast Highway, beginning at Wainui Beach six kilometers from the centre of Gisborne city. 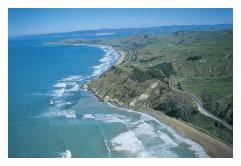 The settlement of Makorori Beach is 10km from Gisborne. A kilometre over the next headland is the reef protected bay at Tatapouri. There are approximately 650 homes. Much of this area is made up of a variety of reserves and coastal foreshore land accessible to the public administered by the Gisborne District Council. The largest tract of public land, the W.D. Lysnar Reserve, runs the length of the seaward side of Moana Road. A major portion of the Wainui-Makorori headland is also reserve along with other smaller areas of land providing beach access along the residential areas of Wairere Road and Pare Street . 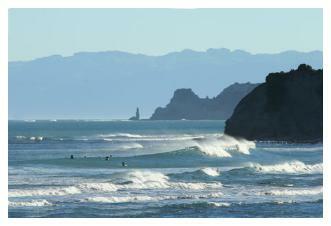 These reserves fringe the foreshore of Wainui Beach and provide critical foreshore protection. The dune system protects the coastline and developments against erosion. Wainui Beach is known for its natural beauty, stunning vistas, nationally renowned surfing conditions and easy accessibility. Included in this reserve is the Whales Grave which remembers the 1970 stranding and subsequent burial of 59 sperm whales. The reserve provides carparking, picnic spots, view points, walking tracks, and access for swimming, sunbathing, surfing, horseriding and jogging. Informal tracks zigzag the dunes. Some of the tracks lead from the road or carparks, down to the beach. There is also an informal track running parallel to the beach, along the length of the dunes. The reserve land off Tuahine Crescent, Wairere, Murphy, Lloyd George, Oneroa and Pare Roads main function is to provide pedestrian access to the beach. A small local population uses the beach year round, however during the summer months there is a large influx of visitors. Makorori Headland and easily accessible dune and beach areas are becoming increasingly popular locations for wedding ceremonies. Good surf can be found along most of the beach throughout the year with the numbers of local, national and international surfers at Wainui and other beaches on the East Cape growing each year. Boat launch beach access is provided at the end of Pare Street. Vehicles must use the most direct route between the ramp and the sea for launching activities. The only patrolled area of the beach is located near the Wainui Surf Lifesaving Club which is busy during the summer with surfing, picnicking, sunbathing, swimmers and surf Lifesaving associated activities. Families also use the two children’s playgrounds located north of the Stream. Rding horses along the beach at low tide is a regular feature and horse access to the beach is recommended at the southern side of Wainui Stream, the Chalet and the Northern carpark. Makorori Headland provides a spectacular walk over its heights with sweeping views of Wainui and Makorori Beaches as well as views south to Mahia Peninsula. Car parking is provided at the Wainui base of the headland with the entrance to the walking track a 50 metre walk up the hill alongside the highway. Between Wainui and Makorori beaches on State Highway 35, is Okitu Bush, a scenic reserve and short walk managed by the Department of Conservation. The native bush found at Okitu Bush is of high quality and provides a good example of original coastal flora. 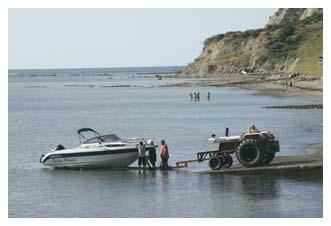 A popular boat ramp is operated by the Tatapouri Fishing Club at Tatapouri Bay. Although accessible by the public the ramp is on private land and the District Council is currently negotiating to acquire the ramp and associated land for community ownership. 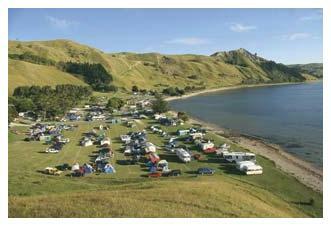 Tatapouri by the Sea is a holiday park at Tatapouri Bay off State Highway 35. A range of seaside accommodation options includes sheltered campsites, log cabins and a family cottage. Communal amenities are available for guests. Tatapouri by the Sea is situated on a 3.8ha block of land and includes the site of the former Tatapouri Hotel which was destroyed by fire in 1996, and earlier hit by a tsunami in 1947.